With 45 years of experience in the industry, our team at Hearing Care Centers cannot wait to help you take charge of your hearing loss. We’re proud to serve the communities of Torrington, Bristol, and West Hartford with our three locations. Hearing Care Centers has a commitment to offering every hearing-management option to the patient, so that they can make the best decision for themselves. Among our featured manufacturers, we are not pressured to fit any hearing device over another, so you can be assured you are getting the most accurate advice for your specific needs. Our ultimate aim is for you to overcome your hearing loss, and we will use a variety of means to ensure that aim is met. We started practicing in 1988 by working with only one manufacturer. As needs have evolved, more manufacturers were added in order to best serve our clients. Over the years, Jack has even created an in-house brand of hearing aids. This shows the depth of technical knowledge we have to help manage your hearing loss. With a stellar reputation across the hearing profession, Widex is a premium brand through and through. They have a strong reputation for innovation, having been the first brand to introduce machine learning technology with their Evoke range in 2018. In 2019, the brand aims to unveil the world’s first ever Fuel Cell powered hearing aid, a device that will never need a battery. The Evoke is the latest line of premium hearing aids from Widex. The Evoke Fusion 2 model uses machine learning technology to cater to your use of the hearing aids. Widex is introducing an age of ‘intelligent hearing’, where the range will learn from millions of users around the world in real time, so it can evolve to serve the needs of the wearer better the more the user wears them. Founded and based in Canada’s ‘Silicon Valley’, Unitron is has been producing hearing solutions for over 50 years. Now part of the Sonova group, they are committed to providing a quality product based on close relationships with both hearing aid manufacturers and hearing science researchers. They now make products that are used in more than 46 countries worldwide. One of their latest triumphs is the Tempus. This is a hearing aid built specially for enabling clear conversation. Unitron knows how much time you spend conversing in any given day, so they have tried to engineer a device that makes speech recognition as clear as possible, giving the wearer 50% more accuracy in hearing conversations than previous models. One of the largest hearing aid manufacturers in the world, Phonak have been making hearing aids for over 50 years and have their products in 100 countries globally. Although initially renowned for their pediatric hearing aids, they have since diversified to offer quality hearing aid technology for everyone, regardless of age. Phonak are excited to reveal the Phonak Marvel range, a Made for iPhone hearing aid that is due to be released in several different sizes over the course of 2019 and beyond. Two of these models will be fully rechargeable, making this range their most convenient yet. Signia, formally known as Siemens hearing division, has a strong track record in hearing aid technology. The company leverages knowledge and experience from their previous incarnation to develop cutting edge hearing technology for tomorrow’s users. This is evident in the quality of their Binax and Primax ranges. The latest platform, the Nx, is another outstanding contribution to the hearing aid market. The flagship model in this range is the Insio, a ‘completely-in-canal’ (CIC) hearing aid that fits so discreetly in the ear that it is virtually invisible to the naked eye. The great news is that despite its size, it is also available for those with profound hearing loss, making it an all-round great choice for those who are looking for their hearing aid to be both powerful in performance and subtle in looks. 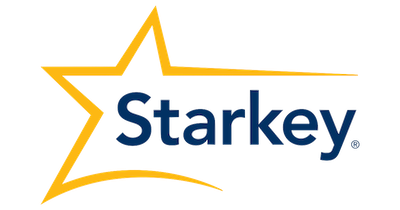 Starkey is a company founded in 1967 by William Austin. It started as a repair shop for hearing aids but has since evolved into one of the leading hearing aid manufacturers in the world. They are known for putting their custom hearing aids in ever small packages, to the delight for customers looking for more discreet hearing aids. This means their range of ITE (in the ear) in the ear and IIC (invisible in canal) hearing aids are highly regarded. The company continues to innovate and was celebrated for making one of the first Made For iPhone hearing aids, the Halo. Their newest offering moves into the trend for wearable technology. Called the Livio AI, it is billed as the world’s first hearing aid to provide both superior sound quality and the ability to track body and brain health. It even has a sensor to act if you have fallen over.